Performances at First Lutheran Church and Grand Central Mall! PSHS High School Jazz Band! 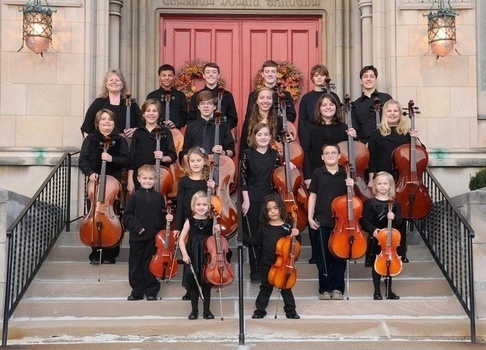 The Cello Company was established in Parkersburg, West Virginia in 1994 by founder and director, Cynthia Puls. Her belief is that all children are talented. She uses the Shinichi Suzuki based principals in her teaching, just as a child learns to talk then to read words, these children are taught to play then to read music. She believes in promoting a family focused environment for the development of these young students. The secret behind the success of these students is their hard work, dedication, parental support, and a love of music. The Cello Company performed for the WTAP telethon to support special needs children at Grand Central Mall, the opening of the WV House of Delegates in Charleston, WV, the opening of the Cultural Art Center (Parkersburg, WV), The Smoot Theater (WV), The Castle (Marietta, OH), The Multi-Cultural Festival (WV), Martin Luther King Celebration at the WV Cultural Center in Charleston, WV, Tamarack in Beckley, WV, as part of their Sunday's at Two Series, performed in the 2nd Annual Beatles Bash held at The Smoot Theatre, performed with the Evergreen Strings at Ohio Valley University (Vienna, WV) and the Marshall String Ensemble at Marshall University (Huntington, WV) as soloist on the Vivaldi Double Cello Concerto. The Cello Company had the privilege of performing with the Camarata Swedish String Ensemble concert as part of The Camarata US tour and with the Kremlin Chamber Orchestra as part of the Kremlin's US tour from Russia. These students participated in the Varga Celebration in February of 2007 - celebrating Laszlo Varga, world renown cellist (University of North Carolina in Greensboro, NC). Janos Starker was in attendance. From 2007-2010 we've been quite active. Several members in 2007 (Zoe Heflin, Henry Wang, Carter Rice, Leighton Roush & Arienne Miller) performed as part of the OU Honor's Orchestra in Athens, OH. The Cello Company performed a Christmas Concert at The Castle in Marietta, OH and several members participated in the 5th Annual Cello Festival at Marshall University, Huntington, WV with Cynthia Puls as the clinician. In 2009, the 6th Annual Cello Festival at Marshall, under the direction of Cynthia Puls, a Cello/Guitar Ensemble Day took place. The group performed at Marietta College as a group with the violin class of David Puls. They end each year with a school day tour. Bravo to a great group of students. The Colony Fest was our 2009 Summer Kickoff held in Marietta, Ohio. Several of our students participated in the Merchants and Artists Walk in Marietta, Ohio this summer as well (2009). Two of our members participated at Wright State University 2nd Annual Chamber Music Weekend (2009)! Henry Wang was chosen for the Governor's School for the Arts at West Liberty College (summer 2009). Leighton Roush was chosen for the GSA in the summer of 2007. Zoe Heflin attended a Mark O'Connor Festival in NYC (summer 2009). The 2009 - 2010 season: October 2009 - Halloween Concert held at Grand Central Mall (our guests were the violinists from David Puls studio). November 2009 - Zoe Heflin, Henry Wang, Carter Rice & Arienne Miller participated in the OU Honor's Orchestra in Athens, OH under the direction of Steven Huang. December 2009- Christmas concerts at The Blennerhassett Hotel for the Holiday of Trees - presented by Easter Seals, Grand Central Mall, The Castle in Marietta and 4 of our cellists (Henry Wang, Zoe Heflin, Carter Rice & Sarah Showalter) participated with the PHS Choir as part of the PHS Choir concert (both a cappella and the freshman concert). January 2010 - Zoe Heflin and Carter Rice participated at the 3rd Annual Wright State University Chamber Music Weekend. February 2010 - The Cello Company along with Julio Alves (Marshall University) presented their 2nd Annual Guitar Cello Ensemble Day. March 2010 - Zoe Heflin, principal cellist & Henry Wang, 3rd chair cellist, performed with the WV All-State Orchestra. April 2010 - Four cellist: Henry Wang, Zoe Heflin, Carter Rice & Sarah Showalter performed as part of the PHS Talent Show. The Cello Company performed their annual school tour at: Edison Jr. High, Mineral Wells Elementary School and ended at The Arbors in Marietta, OH. April 2010 - Joseph Krupinski , cellist, received superior rating on his cello solo in Huntington, WV. May 2010 - Four cellist: Henry Wang, Zoe Heflin, Arienne Miller & Sarah Showalter, performed in the Warren High School Variety Show. Whew....what a year! In 2011: Zoe Heflin and Henry Wang auditioned and were accepted into the WV All-State Orchestra (2nd and 3rd chair respectively). Carter Rice, Arienne Miller, Henry Wang, Zoe Heflin and Sarah Showalter were members of Steven Huang's OU Honor's Orchestra event. Zoe Heflin auditioned, was accepted as assistant principal cellist, in the WV Honor's Orchestra event held at WVU in Morgantown, WV. Arienne Miller received superior ratings at the Ohio Solo and Ensemble Contest. Ethan Powers and Wade Powers received superior ratings at the WV Solo and Ensemble Contest with Ethan Powers recognized as a finalist for the WV Recital Solo and Ensemble Contest. Zoe Heflin returned to Wright State University in Dayton, OH as a participant in their 4th Annual Ensemble Weekend. Joseph Krupinski received superior rating on his solo in Huntington, WV as part of the private school solo and ensemble contest. Sarah Showalter, Zoe Heflin and Henry Wang were awarded with Maestro Awards for their accompaniment of the PHS Choir under the direction of Pam McClain. We performed our Halloween Concert at the mall this year and our Christmas Concerts at the mall and The Castle. Henry Wang performed his senior recital. We ended our year with our 12th School Day Tour. We toured WV up the Ohio River. What a year guys!!!! Go Cello Company! In 2012: Zoe Heflin, Arienne Miller, Ethan Powers, Ryan Phipps, Carter Rice, and Sarah Showalter participated in Ohio University's Honor's Orchestra. Zoe Heflin (principal) and Sarah Showalter participated in WV All-State Orchestra. Ryan Phipps auditioned and participated in WV Governor's School of the Arts. The Cello Company performed their annual Halloween Concert (at Grand Central Mall) and their Christmas Concert (at The Castle in Marietta, OH, and at Sam's Club in Vienna, WV). The Cello Company performed their 13th annual School Day Tour. Way to go Company!!! Zoe Heflin presented her junior recital and Arienne Miller presented her senior recital. In 2013, Zoe Heflin, Ryan Phipps and Sarah Showalter were awarded Maestro Awards with the PHS choir. Zoe Heflin presented her senior recital. The Cello Company performed their annual Halloween Concert, Christmas Concert and 14th School Day Tour. Zoe Heflin (assistant principal), Ryan Phipps and Sarah Showalter auditioned and performed with the WV All-State Orchestra. Ryan, Sarah, Zoe were also participants in the OU Honor's Orchestra under the direction of Steven Huang. In 2014, Ryan Phipps received superior ratings and was recommended to the WV Honor's Recital. He was chosen and performed during the 2014 WVMEA Convention. Ryan Phipps was principal cellist with the WV All-State Orchestra, Ethan Powers sat 5th chair this year. Ryan Phipps was accepted into Marshall University in Huntington, WV. He presented his senior recital in May of 2014. Ryan, Ethan, and Wade Powers performed with the OU Honor's Orchestra under the direction of Steven Huang. The Cello Company performed their annual Halloween Concert, Christmas Concert and 15th School Day Tour. In August of 2014: Ryan Phipps, Zoe Heflin, Ethan Powers, and Wade Powers, participated in OU's Mozart on the Green. They performed Heitor Villa-Lobos, Bachianas Brasileiras No. 5 for 8 cellos and mezzo soprano. 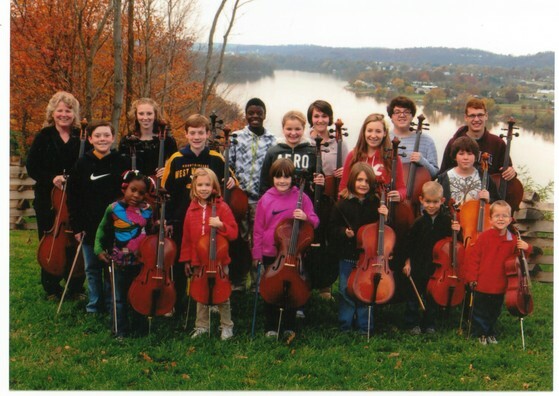 In 2014-2015, Noah Parker, Ethan Powers, Wade Powers, Isaiah Powers, Lucy Powers, Edie Tidd, Simone Geogerian, and Ella Rockhold participated in ASTA String Day under the direction of Steven Huang in Williamstown, WV. Ethan Powers, principal cellist and Wade Powers were participants in the High School WV All-State Orchestra. Edie Tidd, principal cellist, Lucy Powers and Isaiah Powers were founding participants in the first year Middle School WV All-State Orchestra. The Cello Company performed their annual Halloween Concert, Christmas Concert and 16th School Day Tour. Ethan Powers, Wade Powers, Ella Rockhold, and Simone Geogerian all auditioned and participated in the OU Honor's Orchestra under the direction of Steven Huang. Many new cellists joined us this year. What a year everyone! In 2015-2016, Ethan Powers presented his Senior Cello and Trombone Recital on June 10, 2016 (Frist Lutheran Church), along side the PSHS Jazz Ensemble. Simone Geogerian presented her Sophomore Cello Recital, on July 24, 2016. The Cello Company presented their annual Halloween Concert with a STAR WARS themed performance (costumes, balloons and a medley). Their annual Christmas Concerts were presented at the Grand Central Mall and at Sam's Club. Great year! In 2016-2017: Wade Powers was principal for WV All-State Orchestra. Simone Geogerian was principal (WVU Honor's Orchestra and co-principal (OU Honor's Orchestra). The Cello Company performed their annual Christmas Concert at First Lutheran Church (19th and Plum, Pkb) on December 9, 2016 along with The Violin Class. The Christmas concert was also presented at Grand Central Mall on Dec. 10th. Way to go! Living, loving and learning the life of being a musician. Cynthia searches out musical experiences for her students. Her class is enthusiastic and hard working. They are dedicated to their team.